Once you have cleared the China and Hong Kong border customs, the first thing you should do is get an Octopus Card. It is the Singapore equivalent of an EZ-link card which you could add money to the card and use it to pay for transportation around Hong Kong. 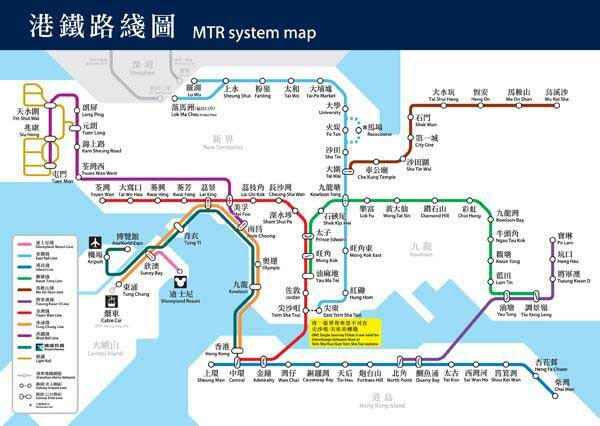 Octopus fares are between 5% and 10% cheaper than ordinary fares on the Mass Transit Railway (MTR), Kowloon-Canton Railway (KCR), Light Rail Transit (LRT) systems and minibuses. This card is sold for HK$150 with an initial value of HK$100. An Octopus card may be returned to any MTR Customer Service Centre for a refund of the remaining value stored on it. A handling fee may be charged for the refund; HK$7 for an Octupus card that had been in use for fewer than three months. The KCR East Rail Line (see light blue line in map below) travels from the Shenzhen-Hong Kong border station (Lo Wu) to the heart of Hong Kong (East Tsim Sha Tsui) and the journey takes about 30-40 minutes. It passes by Mong Kok East and Kowloon Tong so if your hotels are around these area, you can also alight earlier. The cost of travelling between Hong Kong and Shenzhen by the KCR is about HK$40. The train is usually quite crowded so if you want to guarantee yourself a comfortable seat, you can consider buying a first class ticket at twice the regular price. Hi, I am visiting HK in Dec and am looking for booking hotel in HK. will be there with my mum, aunt and my 2 boys (1 sec 2 and 1 pr 5). I have actually booked hotel rooms in Shen Zhen and intended to travel fr Shen Zhen to HK for day trip for about 3 days. However, I was told that the clearing time at the Shen Zhen can be very long. For me with my folks and kids, I may feel very stressed as I have to take care of them as well as beware of pick-pockets. So, what is your advice? Is there any cheap and decent hotels in HK to be considered for my group? Customs clearance at Shenzhen-Hong Kong border can be quite a nightmare especially during peak hours e.g. when people are crossing the border for work or going home – so start your journey at off-peak hours e.g. late mornings or afternoon. Hi, if I am travelling from Singapore to Shenzhen than to Hongkong n back to shenzhen, do i need to apply for visa. if you are Singaporean, you dont need a visa. How do we travel from Shen Zhen to Hong Kong? Can you explain to me in details? The KCR East Rail Line travels from the Shenzhen-Hong Kong border station (Lo Wu) to the heart of Hong Kong (East Tsim Sha Tsui) and the journey takes about 30-40 minutes.